Hidden in a valley between two ridges, relatively close to US-31 but oblivious to those zipping along the state highway, is a wonderful, nature reserve with a mile of designated trout stream, wetlands, rare plants, wildlife, even a pair of nesting bald eagles. The key to exploring Yuba Creek Natural Area is just knowing its there. Hidden in a valley between two ridges, relatively close to US-31 but oblivious to those zipping along the state highway, is a wonderful, nature reserve with a mile of designated trout stream, wetlands, rare plants, wildlife, even a pair of nesting bald eagles. The key to exploring Yuba Creek Natural Area is just knowing it’s there. Purchased by Acme Township in 2002 with help from the Grand Traverse Regional Land Conservancy, Yuba Creek is a 413-acre preserve that features more than 5000 feet of its namesake stream, a mix of open and shrub-dominated wetlands, upland hardwood forest and abandoned orchards. Although Yuba Creek, a designated trout stream, no longer supports the fish due to a loss of aquatic habitat and shade, the area is bountiful in wildlife. That includes whitetail deer, otter and mink as well as ruffed grouse, raptors such as red tailed hawk, roughlegged hawk, and coopers hawk and large numbers of waterfowl and geese. A pair of eagles also nest in the area. The park is undeveloped with the exception of three access points. The most visible one is a scenic overlook on US-31, across from the entrance to Bay Ridge development, and features a parking area and an interpretive display. There is also a 0.4-mile trail that loops to the edge of the ridge, the highest ground of the entire property. Here you’ll find a bench where you can see most of the creek below you and possibly even the eagle’s nest across the valley. There is also an access point with roadside parking on Bennett Road, near the curve of the road, at the south end of the natural area. But the main access point is on Yuba Road, just east of US-31, that has a parking area and a trailhead for the main trail. Described and mapped below, the trail is open to hikers as well as snowshoers and Nordic skiers in the winter. But mountain bikes and off-road motorized vehicles are banned. The point-to-point route runs almost the length of the valley while a spur branches off to climb the western ridge. A round-trip hike is only 2.8 miles but it’s enough to allow you to escape the noise and traffic of the state highway for the quiet bliss of this well-hidden valley. From the Yuba Road trailhead you follow a mowed lane that winds through an open meadow and around the cement foundations of what use to be a cherry processing facility. You climb slightly and then at Mile 0.3 come into view of Yuba Creek and the valley that surrounds it. It’s a sight that catches you off guard if you’re a frequent traveler of US-31 but never had notion the creek was here. Here Yuba Creek is enclosed by forested ridges but the floor of the valley is open grassy meadow. 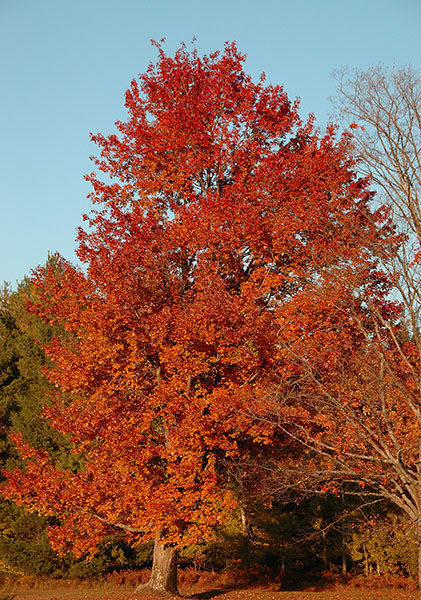 In the fall the grass is brownish gold framed by trees in fiery reds and yellows. At Mile 0.75 you reach a bench just above the trail to the west (left) and almost directly across the valley from the eagle’s nest. 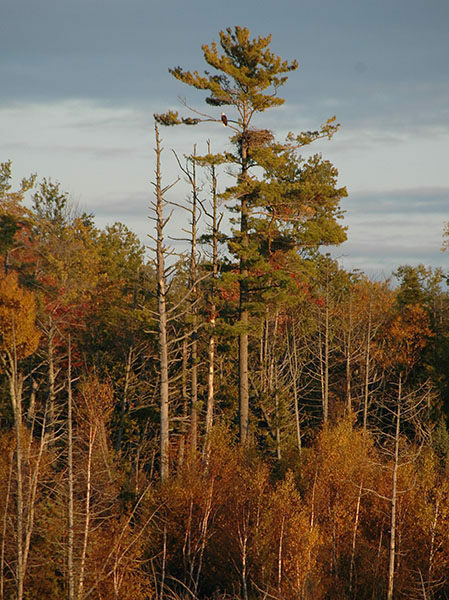 Topping the tallest pine in the valley, the huge nest is easy to spot and a busy place April through July when the birds are raising their young. At Mile 0.9 is the only junction. To the west a path climbs the ridge for 0.4 mile ending as a small cul-de-sac near US-31. Along the way you pass a bench with a view of Yuba Creek Valley. Straight ahead the trail continues for 200 yards to arrive at a stand of hardwood trees, a mile from the trailhead. The only way back to your vehicle is to backtrack. Parking areas and information displays are at the Scenic Overlook along US-31 and the Yuba Road trailhead. The natural area is open year-round and there is no entrance fees. The area is open to hunting during deer season. From the M-72 and US-31 junction in Acme, the Yuba Creek Scenic Overlook is 3.5 miles north on US-31 across from the Bay Ridge development. 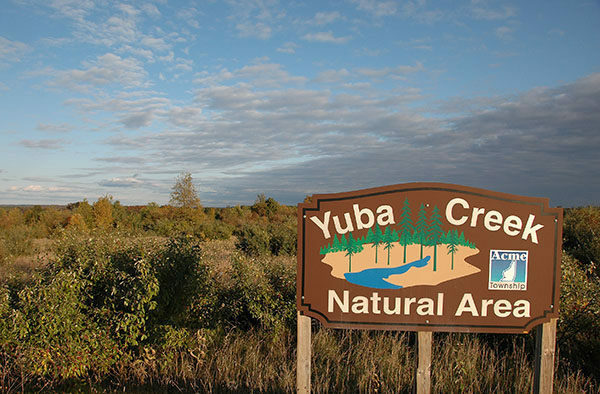 Four miles north from the M-72 and US-31 junction is Yuba Road and just to the east is the parking area and trailhead for the Yuba Creek Trail. Contact Acme Township Parks and Recreation (231-938-1350; www.acmetownship.org) or the Grand Traverse Regional Land Conservancy (231-929 7911; www.gtrlc.org/). For lodging or travel information contact Traverse City Tourism (800-872-8377; www.traversecity.com).